In 15 years of increasing average test scores, black-white and Hispanic-white student achievement gaps continue to close, and Asian students are pulling away from whites in both math and reading achievement. For the improving groups, these long-term trends may be a major educational success story. In stark contrast, Hispanic and Asian students who are English language learners (ELL) are falling further behind white students in mathematics and reading achievement. And gaps between higher- and lower-income students persist, with some changes that vary by subject and grade. Meanwhile, the proportion of low-income students in U.S. schools has increased rapidly, as has the share of minority students in the student population. The chances of ending up in a high-poverty or high-minority school are highly determined by a student’s race/ethnicity and social class. For example, black and Hispanic students—even if they are not poor—are much more likely than white or Asian students to be in high-poverty schools. These disparities represent a stubborn educational failure story. Attending a high-poverty school lowers math and reading achievement for students in all racial/ethnic groups and this negative effect has not diminished over time. And attending a school in which blacks and Hispanics make up more than 75 percent of the student body lowers achievement of black, Hispanic, and Asian students but does not affect white students (in some of the analyzed years it actually had a small positive influence on math test scores for whites). These patterns of change (or lack of change) could have important implications for what is happening in American society in general and in U.S. schools in particular. Sustaining our democratic values and improving our education system call for a host of more coordinated and widespread education, economic, and housing policies—including policies to raise curricular standards, tackle insufficient funding for schools with a large share of low-income students, promote access to education resources from early childhood to college, improve dual language programs, provide economic support for families, and create more integrated schools and neighborhoods. A founding ideal of American democracy is that merit, not accident of birth, should determine individuals’ income and social status. Schools have assumed a major role in judging key elements of merit among young people—namely, academic skills, hard work, self-discipline, and cooperative behavior. Schools do so mainly by evaluating students in a variety of subjects deemed important for success later in life. No one expects outcomes at the end of the schooling process to be the same for every student, since initial ability varies, and some young people are more disciplined and willing to work harder in school than others. Yet, when students’ inherent characteristics—such as race, gender, or parents’ economic and social capital—rather than their innate ability, hard work, and discipline systematically affect their school outcomes, this threatens democratic ideals. These apparent contradictions between the ideals and reality of U.S. schools have led analysts over the last few decades to study and try to explain persistent gaps in student achievement. Particular attention has been given to the gap between blacks and Hispanics versus whites, across social-class groups, and by gender. Research has provided evidence that race and ethnicity continue to be important factors in explaining achievement differences. However, much of the black-white and Hispanic-white achievement gaps are accounted for by social-class differences. That is, in the United States, race and often ethnicity are closely intertwined with social class. Minority children, particularly African-Americans and Hispanics, are more likely to be poor than white children because of the ways that race and ethnicity shape opportunity and economic outcomes. Black and Hispanic children are also more likely than their white or Asian-American counterparts to live in low-income, racially segregated neighborhoods and to attend schools with high concentrations of low-income, nonwhite students. Notwithstanding these troubling realities, achievement differences between blacks and whites and between Hispanics and whites have shrunk in recent decades. The bad news is that until recently gaps between the higher and lower social-class groups were increasing, particularly between children in the highest income group and everyone else (Reardon 2011; Reardon, Waldfogel, and Bassok 2016; Putnam 2015). This paper advances the discussion of these issues by analyzing trends in the influence of race/ethnicity, social class, and gender on students’ academic performance in the United States. It focuses on trends for two different grade levels—eighth and fourth—and two different subjects—mathematics and reading—over the past decade. Trends in eighth-grade mathematics since the mid-1990s are also examined. This paper also explores the ways in which English language ability relates to Hispanics’ and Asian Americans’ academic performance over time (Nores and Barnett 2014). We use individual student microdata gathered from the National Assessment of Educational Progress (NAEP) to estimate the math and reading performance of students in the fourth and eighth grades from 2003 to 2013, and the math performance of eighth-graders from 1996 to 2013. Our unique approach, which uses individual student microdata gathered from NAEP over a substantial period of time (10 to 17 years, depending on the subject and grade), allows us to estimate changes in race/ethnic gaps, controlling for English-language learner designation, gender, and socioeconomic status. The approach also lets us estimate changes in socioeconomic gaps, controlling for race/ethnicity, gender, and ELL designation. Moreover, we can assess changes over time with regard to the sensitivity of race/ethnic and socioeconomic gaps to the inclusion of controls for school characteristics in terms of the proportion of poor and minority children in the student body. The percentage of students receiving free or reduced-price lunch (FRPL) is used as a proxy measure for the poor children in the student body.1 We characterize a school as high-poverty when more than 75 percent of its students are eligible for FRPL. Importantly, because we use individual student data from large-scale assessments for our analysis, we can identify those students assigned to the English language learner track. We can therefore separate Hispanic and Asian ELL students from their non-ELL ethnic counterparts and examine their distinct performance and trends. Finally, our approach enables us to show how estimates of race/ethnic achievement gaps are affected by the unequal share of race/ethnic groups across those states in which students have systematically performed better or worse on the NAEP. The results of our analysis yield important insights into the changing nature of inequality in the U.S. education system. We find that between the mid-1990s and 2013, the proportion of low-income students in U.S. schools—those eligible for free or reduced-price lunch (FRPL)—increased rapidly. By 2013, more than half of eighth-grade mathematics students were eligible for FRPL (52.1 percent), up from 35.1 percent in 2000. In addition, the proportion of Hispanic and Asian students increased, in contrast to a steady decline in the percentage of non-Hispanic white and black students. As the overall proportion of low-income students (those eligible for FRPL) increased in U.S. schools, the percentage of all students attending high-poverty schools (those with more than 75 percent of students eligible for FRPL)2 rose substantially from 2003 to 2013. The proportion of black and Hispanic students in these high-poverty schools was much higher than for white or Asian students. By 2013, more than 40 percent of black and Hispanic students attended a high-poverty school (43.5 percent of blacks, 40.3 percent of Hispanic non-ELLs, and 55.8 percent of Hispanic ELLs, respectively). In contrast, only about 7 percent of white students (6.9 percent) attended such schools. At least one in five black and Hispanic students (20.7 percent of blacks, 15.1 percent of Hispanic non-ELLs, and 33.9 percent of Hispanic ELLs, respectively) who were not eligible for free or reduced-price lunch attended a high-poverty school compared with just 3.2 percent of non-eligible white students. Asian non-ELLs generally attended schools that had even lower levels of poverty than those attended by white students, although poor Asian non-ELL students were much more likely to attend high-poverty schools than poor white students. We confirm earlier studies showing that although the black/white test-score gap remains large, it has declined substantially in the past two decades. The achievement gap between white students and Hispanic non-ELL students also closed substantially in this period. The achievement gap between white students and Asian non-ELLs greatly increased in favor of Asians. By 2013, Asian non-ELL students scored almost half a standard deviation (SD) higher than white students in math. Moreover, the gap between Asians and whites in math was even larger among higher-scoring students. Adjusting for the higher concentration of Asian non-English language learner students in California and Hawaii, two low-scoring states, reduces our estimates of Asian students’ scores compared to what they would have been had they lived in higher-scoring states. This “state effect” also tends to be true for our estimates of the scores of Hispanic non-ELL students (who are concentrated in California and the Southwest), and for the estimated scores of African Americans (who are concentrated in southern states, which generally score lower on the NAEP). Attending a higher-poverty school had a negative influence on the math and reading achievement of students from all racial/ethnic groups in both fourth and eighth grades. This negative influence was smaller for Hispanic non-English language learners than for whites and blacks, and it was larger for Asians than for other groups. In contrast, attending a school with more than 75 percent black plus Hispanic students had a larger negative effect on black, Hispanic, and Asian students than on white students. Attending the highest-poverty school (with a high proportion of poor students, meaning more than 75 percent of students eligible for FRPL) continues to have a strong negative impact on individual students across racial/ethnic groups, but that impact has not changed over the period 1996–2013. (Note that this is also true for schools with more than 50 percent of students who are FRPL-eligible.) We do not find clear evidence that either the black-white or the Hispanic-white achievement gap is increasing more among those students who attend higher- versus lower-poverty schools, or among those who attend schools with higher concentrations of black plus Hispanic students versus those students who do not attend such schools. Our results are also inconclusive about changes in the achievement gap between higher- and lower-income students. We find that changes in the gap vary by subject and grade. Our data are limited to measuring the gap between students who are “not poor,” “somewhat poor,” and “very poor,” but not between students at the top of the income distribution and low- and middle-income students. The divisions used in this analysis are useful for testing differences in student achievement between middle-income and lower-income students, but not between the very highest-income students and those in the rest of the income distribution. It is at the very top of the income distribution (the top 10 percent) where analysts have found student achievement rising compared to everyone else. In terms of gender differences in performance, the advantage of male students over females in mathematics decreased, as did female students’ advantage over their male peers in reading, when controlling for race/ethnicity and social class. The gender gaps are now small compared to race/ethnicity differences, but are still significant. We argue that these patterns of change (or lack of change) have important implications for what is happening in U.S. schools and American society. The decline in the gap between whites and Hispanic non-English language learners may help explain the sense among white workers in lower socioeconomic levels that Hispanics are increasingly competing for their jobs. Although the 2016 presidential campaign has put the focus on undocumented immigrants, the real issue may be that there are increasing numbers of second- and third-generation Hispanic Americans with achievement levels similar to those of whites when adjustments are made for socioeconomic background. Among high-achieving students competing for places in elite universities, the major increase in Asian students’ achievement relative to whites’ (and everyone else’s), especially in mathematics, has probably increased the pressure on upper-middle-class white families to invest even more in their children’s tutoring and outside-of-school academic activities. The percentage of Asian students in the top-25 U.S. universities (as defined by U.S. News and World Report) reached 21 percent of the undergraduate student body in 2007, and has remained at that level. Over the same period, the percentage of whites in those universities fell from 48 percent to 43 percent. As Reardon (2011) argues, increasing inequality in incomes over the past three decades seemed to be a major driver of the widening achievement gap between pupils from the highest 10 percent-income families and everyone else (note that very recent research by Reardon, Waldfogel, and Bassok (2016) indicates that this trend may have been reversed in the last decade). However, another explanation could be the fact that higher-scoring Asians constitute an increasing proportion of high-income Americans, and (non-Asian) high-income Americans are increasingly forced to respond to the reality of academic competition from this group for admission to elite universities. The significant increase, in the 2003-2013 period, of students who attend high-poverty schools appears to have had a negative impact on the achievement gains of all groups of race/ethnic students, particularly whites, blacks, and Asians, in math as well as reading and in both the fourth and eighth grades. Concentration of low social class (and black and Hispanic students) is likely to be significantly reducing math and reading gains in U.S. schools across all states. Finally, although English language learner designation is not an innate characteristic but one that can disappear as the student becomes proficient in the language, English language ability and usage may nevertheless reinforce race/ethnic and social-class identities and stigma. This, in turn, can make the ELL designation a “feature” that carries some of the same negative/positive aspects of academic expectations and treatment as does race/ethnicity and social class. This suggests further exploration may be needed: to see if the fact that Hispanic ELL and Asian ELL students are falling further behind white students is the result of changing rules for assigning students to ELL classes or a decline in the quality of teaching in ELL classes. It also suggests that we should pay greater attention to the widening achievement gap between students who are and are not on the English language learner track and that we should improve our understanding of the effectiveness of dual-language programs that serve minority students who need them to keep progressing in school. Analysts have studied persistent gaps in U.S. student achievement—particularly between blacks and whites, Hispanics and whites, and different social-class groups—for many decades (Coleman, Campbell, and Hobson 1966; Jencks and Phillips 1998; Fryer and Levitt 2004, 2006; Rothstein 2005; Card and Rothstein 2007; Reardon and Galindo 2009; Reardon 2011; Reardon, Robinson-Cimpian, and Weathers 2015; see Musu-Gillette et al. 2016 for a recent review of education indicators by race/ethnicity). They have also examined achievement gaps between boys and girls (for a review, see Robinson and Lubienski 2011). Considerable evidence exists that race continues to be an important factor in explaining achievement differences. However, social-class differences account for much of the black-white and Hispanic-white achievement gap (Reardon, Robinson-Cimpian, and Weathers 2015). Disadvantaged minority children, such as African-Americans and Hispanics, are much more likely to be poor than are white children (DeNavas-Walt and Proctor 2015). Furthermore, there are new questions about whether race and social class interact with gender, resulting in a particularly deleterious effect on the academic performance of disadvantaged minority boys (Gregory, Skiba, and Noguera 2010), and whether school conditions have a greater effect on boys or girls (Autor et al. 2016). Black and Hispanic children are also more likely than whites or Asian-Americans to live in low-income, racially segregated neighborhoods and to attend schools with high concentrations of low-income black and Hispanic students. Part of the achievement gap between race/ethnicity and social-class groups appears to result from social class and racial spatial segregation, and from the concentration of student populations by socioeconomic group and race/ethnicity in different schools (Coleman, Campbell, and Hobson 1966; Hanushek, Kain, and Rivkin 2002). An important issue is the way in which changes in U.S. demographics and racial/ethnic segregation in schools contribute to changes in the achievement gaps between whites and racial and ethnic minorities (Reardon and Yun 2001; Orfield et al. 2014). The good news in the literature is that achievement differences between blacks and whites and between Hispanics and whites have apparently declined over time (Jencks and Phillips 1998; Reardon and Galindo 2009; Rothstein 2013; Reardon, Robinson-Cimpian, and Weathers 2015). The bad news is that until recently the achievement gap between higher- and lower-social class groups appeared to be increasing, particularly between the children in the highest-income group and everyone else (Reardon 2011; Putnam 2015). This may, however, have reversed somewhat in the first decade of the 21st century (Reardon, Waldfogel, and Bassok 2016). This paper advances the discussion of these issues by analyzing trends in how race/ethnicity, social class, and gender relate to academic performance in U.S. schools. Our focus is on different grades and different subjects (mathematics and reading) over the past 10 years and on mathematics since the mid-1990s. We analyze changing achievement gaps between students of different race/ethnic identification, gender, social class, and English language-ability designation in the fourth and eighth grades over the past decade and a half, and how sensitive these gaps are to school composition in terms of the proportion of poor or minority peers. Many of these achievement gaps develop well before entry into school (Lee and Burkam 2002; García 2015) and, on average, continue—or get larger as students progress in school (because those who start out behind academically are more likely to attend schools with fewer resources, which may compound, instead of compensate for, initial disadvantages). Lower-income families are also less able and less likely to invest in academically enriching activities for their children outside of school. The student achievement scores we estimate in the fourth and eighth grade reflect these many influences. We use individual student microdata from the National Assessment of Educational Progress (NAEP) to estimate the math and reading performance of students in fourth and eighth grade from 2003 to 2013, as well as students’ performance in eighth-grade mathematics only from 1996 to 2013. Beyond the crucial philosophical role that equality of opportunity plays in the American identity, why is it important to study school achievement? Is there a significant relationship between achievement and economic and social outcomes? The answer is both obvious and complex. With regard to the obvious, higher test scores are associated with a greater probability of completing high school, and attending and completing a four-year college. Higher levels of school attainment, in turn, are strongly related to improved life outcomes, including but not limited to higher earnings (Belfield and Levin 2007; Alexander, Entwisle, and Oslon 2007). For example, interventions such as increasing the academic activities of low-income youth in summer could have a large enough effect on their test scores to significantly increase the probability that they will attend a four-year college (Alexander, Entwisle, and Oslon 2007). Yet, with regard to the complex, when we account for individuals’ level of education, the effect of student achievement (as measured by test scores) on economic and social outcomes is much smaller than generally assumed (Bowles and Gintis 1975; Murnane, Willett, and Levy 1995; Castex and Dechter 2014; Balart, Oosterveen, and Webbink 2015). Murnane, Willett, and Levy (1995), and Bowles, Gintis, and Osbourne (2001) estimate that, controlling for other factors—including social class—a very large increase of one standard deviation of a test score (about 34 percentage points on a 100 point scale) is associated with (only) a 9 to 10 percent increase in wages. With this in mind, we consider that achievement differences between groups do have economic and social meaning; they give us insights into how well our school systems and society are adapting to demographic, social, and political changes. In other words, we have a system where higher scores produce better outcomes but we have a labor market that seems to reward higher test scores much less than the political rhetoric would have us believe. Our unique approach using NAEP individual microdata over a 10- to 17-year period allows us to estimate changes in race/ethnicity effects, controlling for SES, the designation of English language learner (ELL), and gender, and changes in SES effects, controlling for race/ethnicity, ELL, and gender.4 In addition, we estimate changes in race/ethnic achievement gaps, controlling for state achievement differences (see Carnoy, García, and Khavenson 2015 for a discussion). Since Hispanics and particularly Asians are more concentrated in certain states that may perform lower, on average, than others, controlling for state fixed effects may influence estimates of ethnic achievement differences. We also explore how interactions between racial/ethnic and socioeconomic traits of U.S. students and the characteristics of the schools these students attend relate to student outcomes. We repeat these procedures for male and female students separately to test whether gender differences are important in regard to how race and social class influence student performance. Finally, we estimate tercile regressions to assess whether changes in race and class achievement gaps vary across student achievement levels. The results yield important insights into the changing nature of inequality in the U.S. education system. We confirm earlier studies showing that although the black-white test score gap remains large, it is gradually declining (Hedges and Nowell 1999; Magnuson, Rosenbaum, and Waldfogel 2008). The gap in test scores between Hispanics and whites also continues to decline for non-English language learners (ELL) students, as does the negative female-male gap in math and the positive female-male gap in reading. Because we use individual student data for our analysis, we can identify whether students have been assigned to the English language learner track or not. Thus, we can address the role that language status plays in the trajectory of ethnicity achievement gaps (Nores and Barnett 2014; Nores and García 2014). We find large and somewhat increasing gaps in mathematics and reading achievement between Hispanic and Asian ELL students and other groups, including whites and non-ELL Hispanics and Asians. This is in stark contrast to the achievement gap between white students and non-ELL Hispanic students, which decreased substantially from 2003 to 2013, and the achievement gap between whites and Asian non-ELLs, which increased substantially during this period. It is important to note that English language designation is not an innate characteristic, but one that can change as the student becomes proficient in English. Therefore, it does not have the same meaning as race, ethnicity, gender, and some elements of social class. Nevertheless, English language ability and usage can reinforce race/ethnic and social class identities and stigma, which can make ELL designation a student “feature” that carries some of the same negative/positive aspects of academic expectations and treatment as race/ethnicity and social class. This suggests that we should be paying much more attention to the “language gap” in U.S. education for the about 9 percent of ELL students in fourth grade (of which 76 percent are Hispanic students and 10 percent Asian students) and the about 5 percent in eighth grade (of which 70 percent are Hispanics and 13 percent Asians).5 Similarly, it is important to improve our understanding of the effectiveness of dual-language programs that serve minority students who need them to continue their progress in school. We are not able to confirm that the achievement gap is unequivocally increasing between students from high- and low-social class families; changes in the gap vary by subject and grade. However, our data are limited to measuring the gap between students who are “not poor,” “somewhat poor,” and “very poor.”6 These are reasonable measures for testing differences in student achievement between middle- and lower-income students, but not between the very highest-income students and students at the rest of the income-distribution levels. It is only at the very top of the income distribution (top 10 percent) where analysts have found student achievement rising compared to everyone else (Reardon 2011). Further, we show that as the overall proportion of poor students in schools increased from 2003 to 2013, the percentage of both black and Hispanic students in high-poverty schools rose substantially. We also show that Hispanic students are as or more likely than white students to attend high-poverty schools (García and Weiss 2014). We find inconsistent evidence that the achievement gaps for blacks and for Hispanics in high-poverty schools are increasing. However, we do find that among black and Hispanic students, the achievement gap are increasing between those blacks and Hispanics who attend schools with a high concentration of black plus Hispanic students versus those who do not. We suggest that the increase in Hispanic and Asian non-ELLs in the U.S. school population, combined with the declining achievement gap of Hispanic non-ELLs and the increasing Asian non-ELL gap, may help explain broader social phenomena. One is the seeming increase in opposition to Hispanic immigration among less-educated whites, which some speculate is rooted in shifts from an industrial to a service economy. But these anti-immigration sentiments could conceivably be fueled by the rising school performance and labor competitiveness of non-ELL second- and third-generation Hispanics, as well as their growing numbers. Another phenomenon is increased pressure on some groups to invest more in raising their children’s test scores. The pressure may be associated with the growing gap between whites and Asian non-ELLs, and it is probably greatest on higher-income—and higher-scoring—whites “competing” in the battle for places in elite colleges and high-income jobs. This pressure to increase test scores may help explain why the gaps in test scores among different social classes were expanding until recently (Reardon 2011; Reardon, Waldfogel, and Bassok 2016). The paper is divided as follows: In the next section, we present our estimation strategy. The section after that presents the results, and the final section discusses the results and draws conclusions. How do we estimate achievement gaps by race/ethnicity and social class over time? We use ordinary least squares to estimate a series of step-wise models of student achievement in mathematics and reading in fourth and eighth grade as a function of (1) gender; (2) race/ethnicity; (3) whether the student is designated an English language learner; (4) parental education; (5) eligibility for free or reduced-price lunch; (6) whether a student is enrolled in an individual education plan (special education); (7) the percentage of students eligible for FRPL in the school the student attends; and (8) the total percent of black plus Hispanic students in the school the student attends. We also estimate OLS regressions that include interactions of student race/ethnicity and eligibility for free or reduced-price lunch with the percentage of students eligible for free lunch and the racial composition of the school the student attends. Where Aij is achievement on NAEP mathematics or reading tests of student i in the fourth or eighth grade in school j;10 Xi is a vector of student characteristics; FRPLj is the percent of students eligible for FRPL in school j; Mj is the percent of black plus Hispanic students in school j; Xi*FRPLj and Xi*Mj are interactions of student characteristics with school composition variables; and eij is an error term. In equation 1b, Aijs is achievement on NAEP mathematics or reading tests of student i in the fourth or eighth grade in school j in state s. States are state dummies. As mentioned above, equations 1a and 1b are estimated following a step-wise procedure. Model I includes only student characteristics as independent variables; Model II (“without state fixed effects”) estimates the b’s, including controls for school FRPL and minority composition; Model II (“with state fixed effects”) estimates the b’s, including controls for school FRPL and minority composition plus state fixed effects; and Model III is the complete model, including interaction variables without state fixed effects. In this analysis, the parameters of interest are the b’s, d’s, and h’s for each of the years of the NAEP from 1996 to 2013. These can be used to trace the trajectories of relationships between students’ race and ethnicity, SES, and the interactions of these individual characteristics with school composition. We posit that the changes in these parameters of interest represent an approximate estimate of the changing minority/white and poor/not poor student achievement gap over time, as well as a measure of how changes in school composition over time may influence the achievement gaps of particular groups of students. To test for heterogeneity of our parameter estimates by gender and student performance level, we also estimate equation (1a, without the state fixed effects) for male and female students separately and for terciles of student achievement. We caution that these are not causal estimates. In the case of estimating the parameters of students’ characteristics, we are primarily concerned with adjusting for a number of variables that could influence race/ethnic and SES achievement gaps in order to understand how the parameters mentioned above influence student performance, and how they have changed over time. The shares of students who fall into various racial/ethnic and FRPL categories are somewhat different in the NAEP fourth- and eighth-grade samples than in the K-12 public education system, due mainly to demographic trends that increase the proportion of Hispanics in lower grades (K–3). The proportion of whites in the NAEP samples also tends to be higher: In addition to sampling students in public schools, the NAEP samples students in private schools, where students are much more likely to be white and less likely to be classified eligible for FRPL. Thus, in the NAEP eighth-grade math sample, white students in 2013 were about 54.2 percent of the total; in the fourth-grade math sample, 52.8 percent.13 Nevertheless, the trends for the NAEP eighth- and fourth-grade samples over time are similar to those trends in the public school system as a whole, in terms of both racial composition and proportion of students eligible for FRPL (see Tables 1 and 2). Because of the rapid increase of Hispanics in the younger population, the proportion of Hispanic students is higher in the fourth than in the eighth grade. Notes: ELL stands for English language learner; IEP stands for individualized education plan (special education students have such plans); FRPL stands for free or reduced-price lunch (federally funded meal programs for students of families meeting certain income guidelines). The divisions across race/ethnicity, socioeconomic status (as measured by the degree of poverty), and language learner status groups described below (see Tables 3a, 3b, 3c, and 4) highlight two characteristics of class divisions in U.S. schools. The first characteristic is that a much higher fraction of black and Hispanic students attend high-poverty schools than white or Asian students. 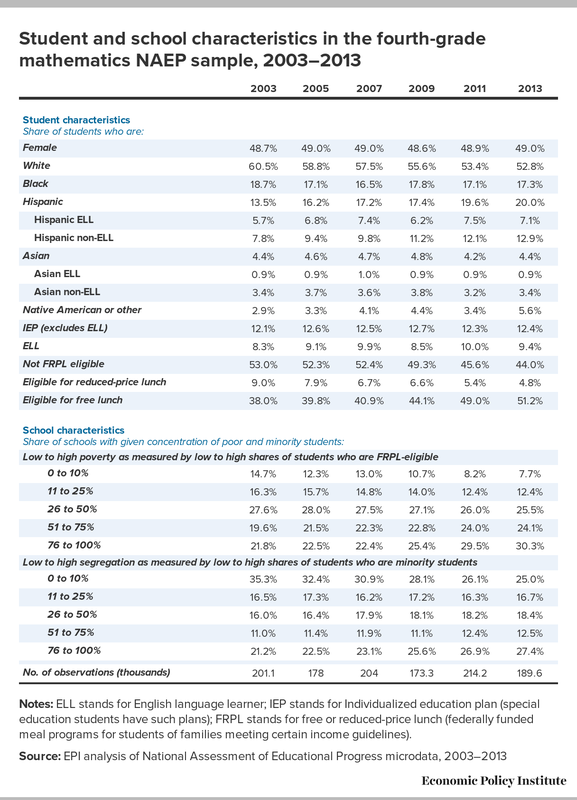 The second characteristic is that black and Hispanic students are much more likely to attend high-poverty schools even when they are not poor; i.e., black and Hispanic students who are not poor are still more likely to attend schools that have large proportions of poor students than are white or Asian students (generally, see details below). 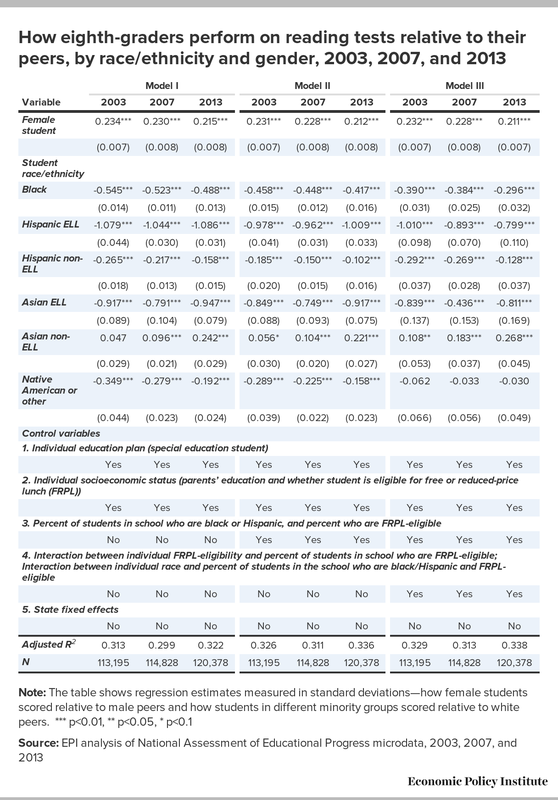 Poor students, and black and Hispanic students, were much more likely to attend a school with a high percentage of students eligible for FRPL, and to attend a school with a high percentage of black and Hispanic students (see Tables 3a, 3b, and 3c, and Table 4, year 2013 panels). For example, in 2013 (Table 3a), only 6.1 percent of the economically more advantaged eighth-grade students in the NAEP math sample in 2013 (that is, those who were not eligible for FRPL) attended a school where more than 75 percent of students were FRPL eligible. Only 25.8 percent of the more advantaged group attended a school where more than 50 percent of students were eligible for free or reduced-price lunch. A much larger proportion of students who were not eligible for FRPL (39.4 percent) attended a school with 25 percent or less students eligible for FRPL. At the other extreme, 39.5 percent of those students eligible for free lunch attended a school where more than 75 percent of students were eligible for free or reduced-price lunch, and 71.2 percent of students eligible for free lunch attended a school where more than half the students were FRPL-eligible. Thus, a high proportion of poor students attend schools with other poor students, and a high proportion of students who are not poor attend schools with relatively few poor students. 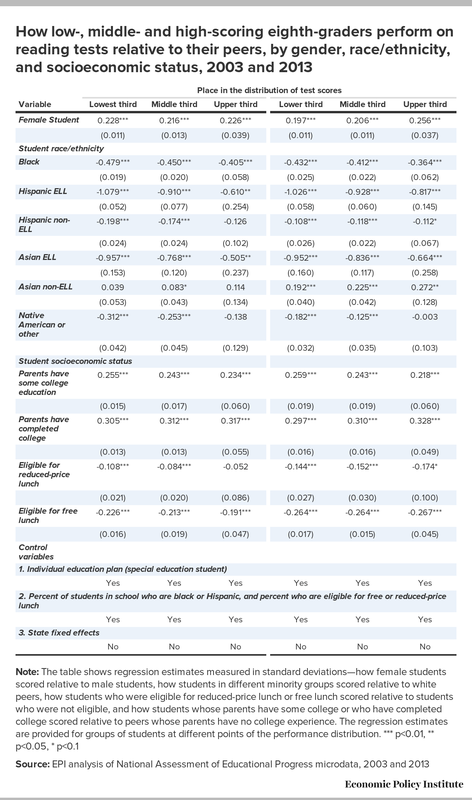 When we look at students by race/ethnicity and language status (Table 3b), we see that over 40 percent of black and Hispanic eighth-grade math students in 2013 attended a school with more than 75 percent FRPL-eligible students (43.5 percent of black students, 40.3 percent of Hispanic non-English language learners, and 55.8 percent of Hispanic ELLs attended such a school). In contrast, only 12.0 percent of Asian non-ELLs and 29.8 percent of Asian ELLs attended a school where more than 75 percent of students were eligible for free or reduced-price lunch. An even lower 6.9 percent of white students attended such a high-poverty school. 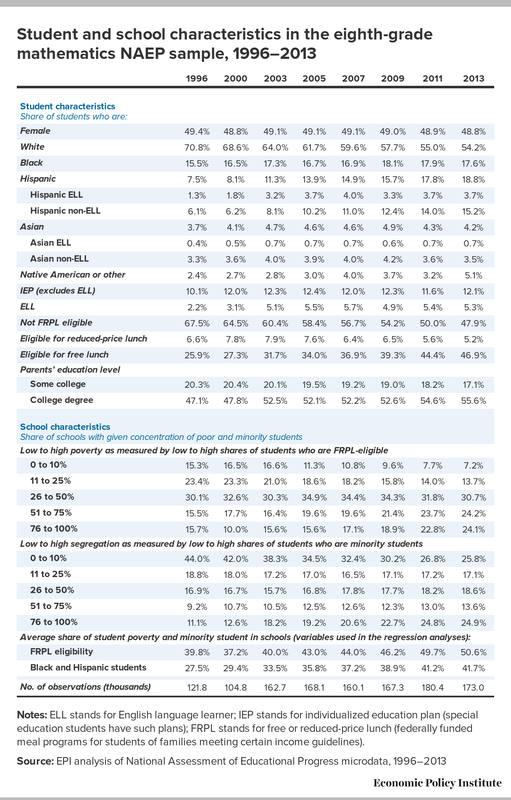 Further, a very low 3.2 percent of advantaged white students (those ineligible for FRPL) attended a high-poverty school (a school where over 75 percent of students were FRPL eligible) in 2013 (see Table 3c); and one of six (16.0 percent) poor white students (those eligible for free lunch) attended a high-poverty school. In contrast, among advantaged black students, 20.7 percent attended a high-poverty school, while more than one-half (52.5 percent) of poor black students attended a high-poverty school. That is, poor black students were three times as likely to attend a high-poverty school as poor white students, and non-poor (or advantaged) blacks were more than six times as likely to attend a high-poverty school as non-poor whites. Advantaged Hispanic non-ELL students were less likely than advantaged black students to attend a high-poverty school, but much more likely than advantaged white students to attend high-poverty schools (15.1 percent of Hispanic non-ELL students were in high-poverty schools). Also, a slightly lower proportion of poor Hispanic non-ELLs (51.1 percent) attended a high-poverty school than did black students (52.5 percent), and both these shares were far greater than whites’ proportion (16.0 percent). However, relative to white students of similar poverty levels, a much higher proportion of both advantaged and poor Hispanic ELL students attended a high-poverty school: 33.9 percent of non-poor and 59.1 of poor Hispanic ELLs attended high-poverty schools. Among non-poor students, Hispanic ELL students were twice as likely as Hispanic non-ELLs, and 10 times as likely as whites, to attend high-poverty schools. On the other hand, advantaged Asian non-ELL students were more likely than advantaged whites to attend very low-poverty schools (schools where 10 percent or less of students were eligible for free or reduced-price lunch). The share of non-poor Asian non-ELL students attending very low-poverty schools was 27.4 percent compared with 19.0 percent of non-poor whites in such schools, although poor Asian non-ELL students were much more likely than poor white students to attend a high-poverty school (28.5 percent versus 16.0 percent). Not surprisingly, U.S. schools are also racially segregated. This is particularly important because, as we show below, the proportion of blacks and Hispanics in the schools these students attend is negatively correlated with their individual achievement. In 2013 (see Table 4), a white eighth-grader (in the math sample) was 73.9 percent likely to attend a school with less than 25 percent black or Hispanic students. Yet, a black student or a Hispanic non-ELL student were, respectively, 13.8 percent and 14.8 percent likely to attend a school with less than 25 percent black or Hispanic students. In addition, black and Hispanic non-English language learners were about 43 percent likely to attend a school with 75 percent or more black or Hispanic students (42.8 percent and 43.5 percent, respectively). The figures for Hispanic ELL students were 9.0 percent in low-minority schools and 55.5 percent in high-minority schools. Asian ELL students had only a 13.0 percent likelihood of attending a school with more than 75 percent black or Hispanic students, and this percentage was even lower for Asian non-English language learner students (8.4 percent). Our results show that in the first decade of the 21st century, there was a large increase in the percentage of students eligible for free or reduced-price lunch (our measure of student poverty). Largely because of this, the total percentage of students in schools with more than 75 percent poor students increased from 2003 to 2013. We also find that, following what had started in previous decades, there was a large increase in the proportion of Hispanic students, which raised the total percentage of schools with large shares of minority students. This to a certain degree expanded the concentration of blacks and Hispanics in schools with high concentrations of FRPL-eligible students, since these black and Hispanic students were also more likely to be poor than the average student. The percentage of students eligible for free or reduced-price lunch increased from 2003 to 2013, from 39.6 percent to 52.0 percent in eighth-grade (math sample, see Table 1), and in fourth grade, from 47.0 percent to 56.0 percent (math sample, see Table 2). The total percentage of eighth-graders in schools with more than 75 percent FRPL students, for example, increased between 1996 and 2013, from 15.2 percent to 21.6 percent; all of that increase occurred after 2003.15, 16 The percentage of free lunch eligible students—the poorest students—attending schools with more than 75 percent FRPL students also increased in this period, but entirely before 2003. The main increases in the percentage of those attending schools with high percentages of FRPL students occurred for those less-poor students (eligible for reduced-price lunch) (Table 3a). Notes: In this analysis, we use the free or reduced-price lunch (FRPL) status classification for individual poverty, and the proportion of students who are FRPL eligible in the school for school poverty. Students who are not eligible for free or reduced-price lunch are not poor; students who are eligible for reduced-price lunch (RPL) are poor, and students who are eligible for free lunch (FL) are the most poor. 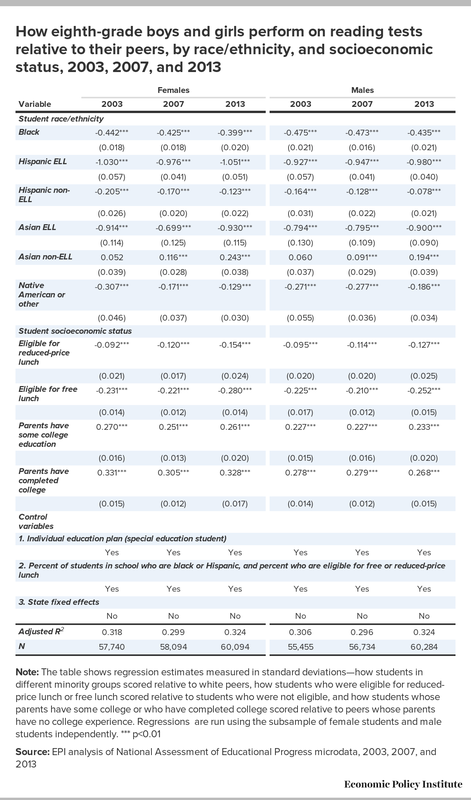 At the same time, the proportion of students attending a high-poverty school increased more overall for blacks and Hispanics than for whites and Asians (Table 3b). 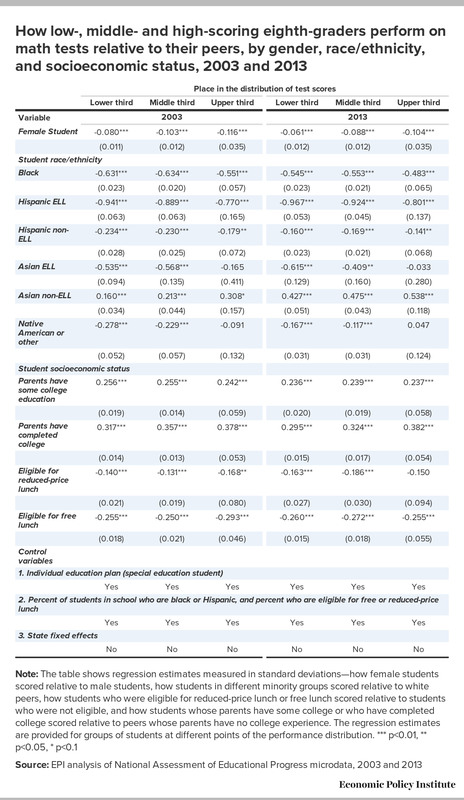 Table 3c shows changes over time in the proportion of students attending low- and high-poverty schools (as measured by the percentage of FRPL-eligible students in the schools’ student body) by race/ethnic group and individual students’ own level of poverty (as measured by eligibility for FRPL). It was not the proportion of the poorest blacks and Hispanics (those eligible for free lunch) attending a high-poverty school that increased; rather, the increase was highest among less-poor blacks and Hispanics (those eligible for a reduced-price lunch). Although less-poor Hispanics constitute a much smaller group than those eligible for free lunch, it is possible that for this less-poor group of blacks and Hispanics, the negative effect of being in a high-poverty school might be greater. We test this proposition in the analysis below. Share of eighth-grade mathematics students attending schools with a given concentration of poor students, by race and ethnicity, 1996, 2003 and 2013. Note: ELL stands for English language learner. Notes: In this analysis, we use the free or reduced-price lunch (FRPL) status classification for individual poverty, and the proportion of students who are FRPL eligible in the school for school poverty. Students who are not eligible for free or reduced-price lunch are not poor; students who are eligible for reduced-price lunch (RPL) are poor, and students who are eligible for free lunch (FL) are the most poor; ELL stands for English language learner. We also find that as the percentage of black and Hispanic students increased from 1996 to 2013, the likelihood that students of all ethnic groups would attend schools with a high fraction of black and Hispanic students also increased. In percentage-point terms the increase was modest for white eighth-grade students (from 5.2 percent to 8.6 percent) attending a school with more than 50 percent blacks and Hispanics, but greater for blacks (from 51.8 percent to 64.2 percent), and for Hispanics (from 64.2 percent to 76.5 percent for ELLs, and from 60.3 percent to 66.1 percent for non-ELLs). 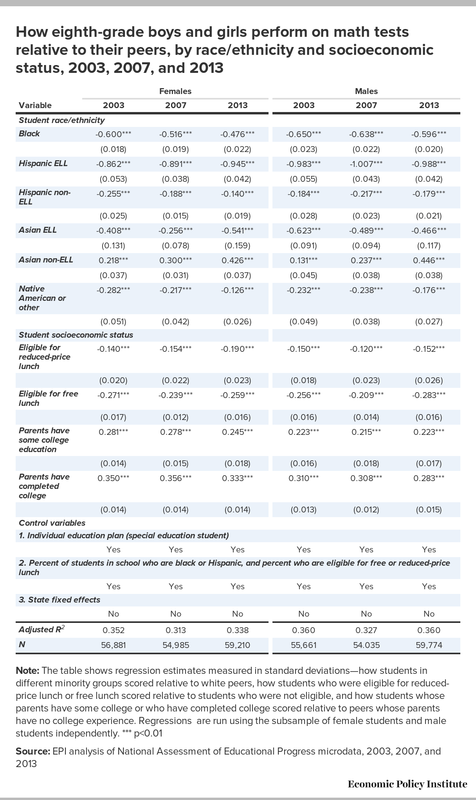 The proportion of Asians attending schools with more than 50 percent Hispanics or blacks also increased (from 25.7 percent to 37.5 percent for ELL students, and from 19.3 percent to 23.1 percent for non-ELLs (Table 4). 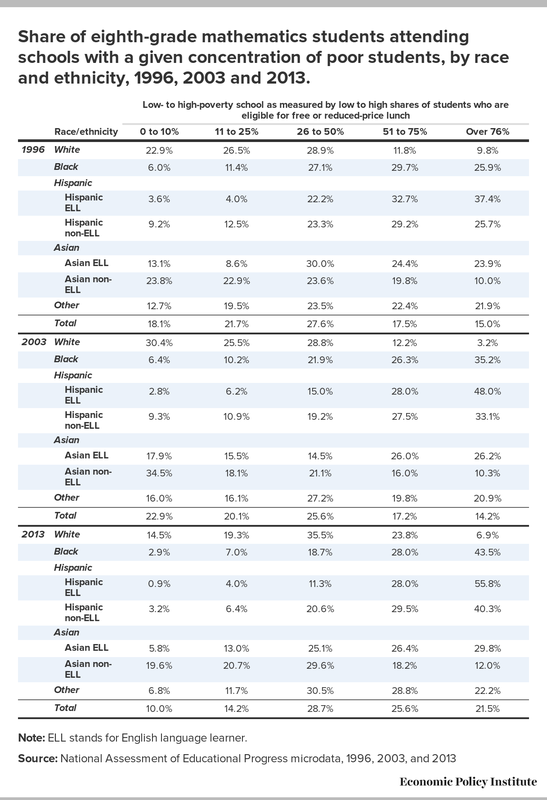 Thus, Table 4 shows some evidence of a greater concentration of blacks and Hispanics in schools with high concentrations of black and Hispanic students, particularly between 1996 and 2003. Equally important, during this entire period, the differences in the racial/ethnic composition of schools that whites attend and that blacks and Hispanics attend remained vastly different. Even Asian students attended schools that were likely to have a higher fraction of black and Hispanic students than those attended by whites. Note: ELL stands for English language leaner. Our main findings on changes in student achievement during this period are that the black-white and the non-ELL Hispanic-white achievement gaps fell in the late 1990s and the first decade of the 2000s, while the non-ELL Asian-white gap (in favor of Asians) increased substantially. This was not the case for Hispanic English language learners and Asian English language learners, as the large negative gap between white students and both groups increased during this period. We also find that the social-class achievement gap between students from poor and non-poor families decreased in the 1990s, but then increased somewhat in the 2000s. These trends were generally the same for both fourth- and eighth-graders. 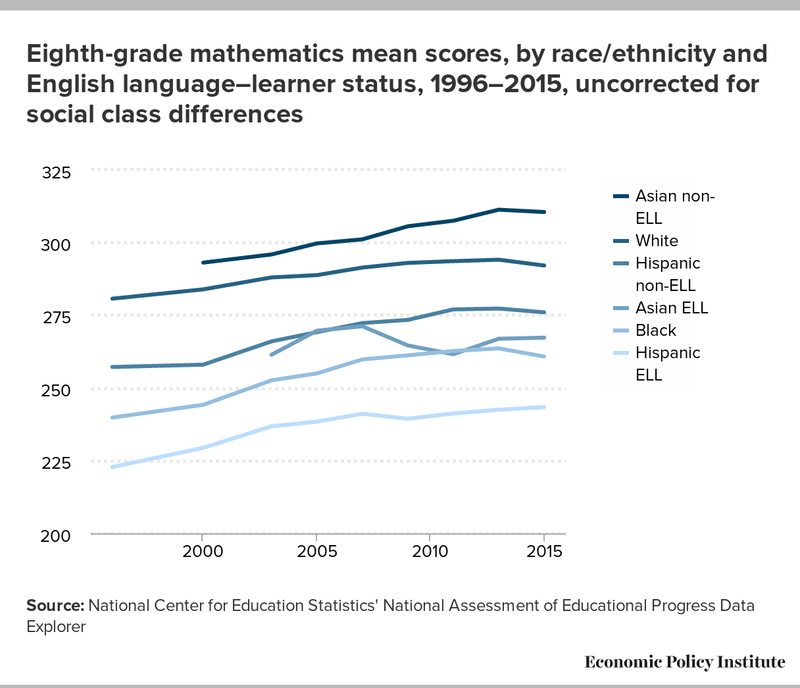 Figure A shows the trends in the average eighth-grade NAEP mathematics scores of whites, blacks, Hispanics (ELL and non-ELL), and Asians (ELL and non-ELL), from 1996 to 2015, without controls for any other student or school characteristics/variables. The scores of Hispanic English language learners and blacks were much lower than those of whites. The scores of Asian ELLs and Hispanic non-ELLs were similar to one another and closer to but still below those of whites, while Asian non-ELLs’ scores were higher. 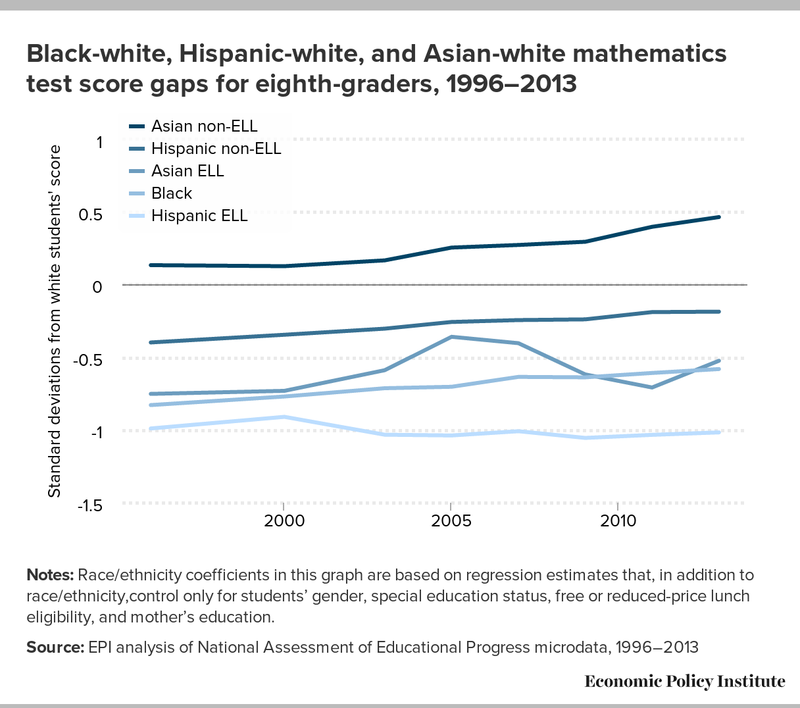 In 2003, the white-black test score gap was -35.4 scale score points, equivalent to about -1 standard deviation (SD) (not shown in figure),17 the white-Hispanic ELL-gap was -51.2 points (about -1.4 SD), and the white-Hispanic non-ELL gap was -22.0 (about -0.6 SD). The white-Asian ELL gap was -26.6 points (about -0.8 SD), while the white-Asian non-ELL gap was 7.9 points (about 0.2 SD). For Asian non-ELLs, Hispanic non-ELLs, and blacks, groups, the NAEP scores relative to whites increased steadily from 2003 to 2013. For ELL Asian and Hispanic children, there was essentially no catch-up relative to whites. Yet, even in 2015, the black-white gap remained high, at -0.9 SD, and the white-Hispanic non-ELL gap was large at -0.4 SD, as was the white-Asian ELL gap, at -0.7 SD. The largest gap remained the white-Hispanic ELL gap, at about -1.3 SD, while the white-Asian non-ELL gap expanded to a 0.5 SD difference. It is important to remember that these racial/ethnic achievement gaps are not adjusted for any social-class differences or changes in social-class differences among groups. The one-fourth of Hispanic students classified as ELLs in eighth grade (math sample) in 2003 scored much lower, about one standard deviation below whites in both math and reading. Asian English language learners scored higher than blacks in math (0.59 SD lower than whites) but much lower in reading (0.92 SD lower than whites). Asian non-ELL students did not score significantly higher than whites in reading but scored 0.17 SD higher in math.20 These race/ethnic differences are large considering that we controlled for free or reduced-price lunch eligibility and parents’ education. As discussed earlier, these differences reflect a complex interaction among socioeconomic, “cultural,” language, and school factors. Noteworthy is the major role of language and the interaction between schooling and language (ELL designation) in school achievement. Whether Hispanic or Asian, English language learners scored lower in both math and reading, and the results are similar for fourth grade, where English language learner designation is more common. Controlling for student race/ethnicity, gender, and whether a student was in special education, eighth-grade students eligible for free lunch scored 0.46 standard deviations lower in math in 2003 and 0.41 SD lower in reading than students not eligible. For students eligible for reduced-price lunch, the gap was about one-half that in both subjects. 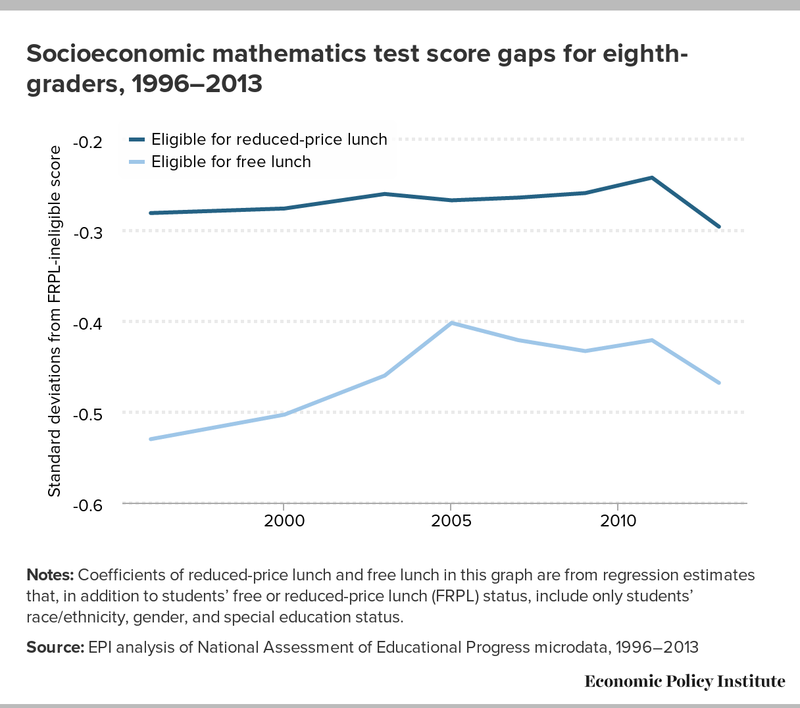 The gaps were larger for students eligible for free or reduced-price lunch in fourth-grade. As was the case with race/ethnicity, students’ poverty status was closely associated with their academic achievement. When race/ethnicity and poverty are combined, the effect is enormous. 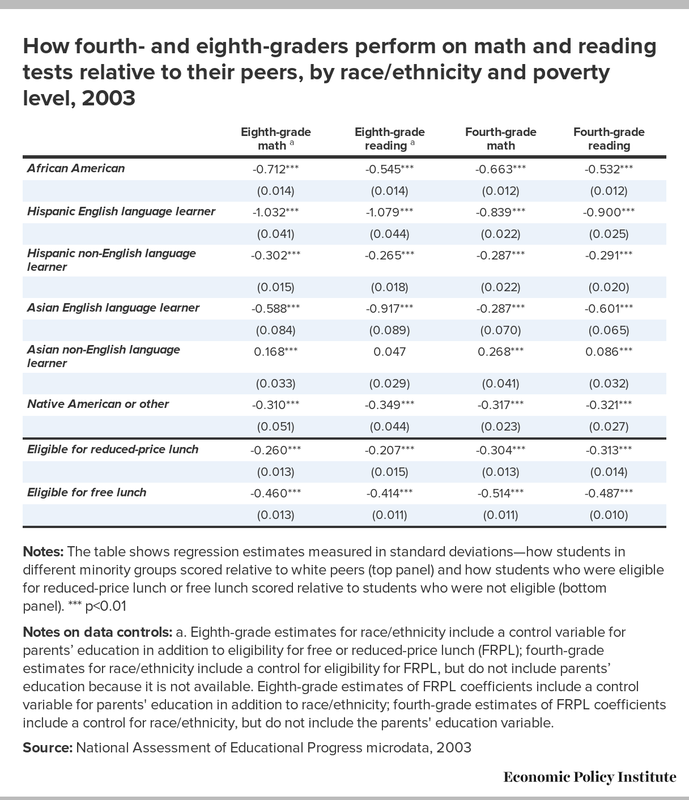 In 2003, black students eligible for free lunch (in poverty) scored about 1.2 SDs lower in eighth-grade math and about 1 SD lower in eighth-grade reading than white students not eligible for FRPL. The gap was even larger for poor Hispanic students designated ELLs. Notes on data controls: a. Eighth-grade estimates for race/ethnicity include a control variable for parents’ education in addition to eligibility for free or reduced-price lunch (FRPL); fourth-grade estimates for race/ethnicity include a control for eligibility for FRPL, but do not include parents’ education because it is not available. Eighth-grade estimates of FRPL coefficients include a control variable for parents' education in addition to race/ethnicity; fourth-grade estimates of FRPL coefficients include a control for race/ethnicity, but do not include the parents' education variable. How did these gaps change over the decade of the 2000s, a period marked by an increasing proportion of fourth- and eighth-graders who are poor and Hispanic, and a period in which all ethnic groups—particularly Hispanics—trend toward attending schools with higher concentrations of low-income and minority (Hispanic plus black) students? The patterns over time of black-white, Hispanic-white, and Asian-white achievement gaps for eighth-grade mathematics and reading scores are shown in Tables 6a and 6b. Model I estimates the race/ethnicity achievement gaps adjusting for student’s gender, whether a student is in an individualized education plan (special education), parents’ education, and whether a student is eligible for free or reduced-price lunch. Model II estimates the achievement gaps for the Model I variables, plus the percentage of students eligible for FRPL and the percentage of black and Hispanic students in the school each individual student attends. Model III adds the interactions of individual student FRPL eligibility with overall school FRPL, student race/ethnicity with school FRPL, and student race/ethnicity with the percentage of Hispanics and blacks in the school attended by the student. In all models for math performance, we offer estimates with and without state fixed effects. The results show that in all three estimated models, the adjusted black-white achievement gap and the achievement gap between whites and Hispanic non-ELLs in eighth grade decreased from 2003 to 2013, and so did the black-white reading gap, though the decline was much smaller proportionately. For blacks, the math gap closes steadily over the 10 years, but for Hispanic non-English language learners, almost all the change in the math gap occurred from 2007 to 2013. One reason that the white-Hispanic non-ELL gap declined is that, across states, requirements for reassignment from ELL to non-ELL might have become more stringent over time. In that case, the Hispanic non-ELL group would have become more “exclusive” and, therefore, the smaller achievement gap may represent merely a change of membership in the group. However, if the requirements had changed, the gap between whites and Hispanics designated ELLs would have also decreased, as a result of improved test-taking capacity of the English language learner group due to fewer higher-scoring Hispanics being reassigned to the non-English language learner group. It is also possible that ELL assignment has become less stringent. A smaller proportion of Hispanics and Asians were in ELL courses in fourth and eighth grade in 2013 than in 2003, which could reflect a smaller percentage of new immigrants in each group or less stringent assignment to ELL. That could explain the increasing gap in white-Hispanic ELL and white-Asian ELL scores, but would imply that the white-Hispanic non-ELL gap would have closed even more and the white-Asian non-ELL would have increased even more in favor of Asian students had assignment requirements stayed the same. We only observe this pattern in Model III (where interactions between race-ethnicity and school SES and race-ethnicity composition are included in the estimate) probably because the percentage of Hispanic ELL students in high concentration, low-SES, and Hispanic schools is increasing over time, and this explains an increasing fraction of the individual Hispanic ELL achievement gap over time. Tables 6a and 6b show that the achievement gap between whites and Asian non-English language learners greatly increased. The increase was especially large in mathematics. By 2013, as the data indicate, Asian non-ELL students scored about one-half a standard deviation higher than white students—up about 0.25 SDs in 10 years. Although the increase in the reading gap is smaller, it is nonetheless about 0.15 SDs. To the contrary, we find the achievement gap between white students and Asian ELL (and between Asian non-ELLs and Asian ELL students) generally became wider. This supports the notion that, on average, school districts are not imposing stricter rules in designating students English language learners.21 It appears that Asian students coming into schools classified as ELLs are either increasingly less proficient than those not so designated, or that schools are doing a poorer job over time of teaching them math and reading. When we added state fixed effects to the three models for mathematics (Table 6a, bottom panel), the estimated coefficients for black and non-ELL Hispanic students rose somewhat, especially for Hispanics. This reflects the tendency of black students and Hispanic non-English language learner students to attend schools in somewhat lower-math-scoring states (the South for blacks and the West/Southwest for Hispanics, typically). Nevertheless, the largest jumps in coefficients, controlling for state fixed effects, were in the math scores of Asian non-English language learners in 2003. This reflects this ethnic group’s high concentration in California and Hawaii, both of which scored rather low in 2003. (About 40 percent of fourth- and eighth-grade Asian non-ELLs in the 2003 sample lived in those two states.) To the contrary, the negative coefficients for Hispanic and Asian ELLs were less negative when we included state fixed effects. This may imply that states such as California, which have the highest proportions of Hispanic and Asian English language learners in the United States (about 45 percent of fourth- and eighth-grade Hispanic ELLs, and 42 percent of fourth-grade and 47 percent of eighth-grade Asian ELLs in the 2003 sample) achieved “better” results with their English learners than did most other states. Such changes in coefficients, which resulted from controlling for state fixed effects, suggest that the Asian-white gap would be even greater in favor of Asian non-ELL students (especially in 2003) were they living in average-scoring states rather than heavily concentrated in lower-scoring California and Hawaii. The argument by Joo, Reeves, and Rodrigue (2016) that Asian-American students tend to attend higher-scoring schools would be even truer were Asian-Americans, on average, living in states where test scores were above rather than below the U.S. average. Tables 6a and 6b also show that females are catching up in math: while eighth-grade females still score lower than males in math, the gap has shrunk in the past 10 years. And males are also catching up in reading, but to a lesser degree. This suggests that the female advantage in reading—at least in middle school—may be more durable than the female disadvantage in math. Unlike the marked decrease in the achievement gaps between white-black and white-Hispanic non-ELLs in 2003 to 2013, and the increase in the white-Asian non-ELL achievement gap, we only observe a small increase in the achievement gap between those somewhat poorer students eligible for reduced-price lunch and those students who were not eligible for FRPL (under Model III, from -0.15 SD in 2003 to -0.17 SD in 2013). In addition, no change is observed in the achievement gap between the poorest students—those eligible for free lunch—and students not eligible for FRPL (under Model III, about -0.27 SD). Nor do we observe more than a small decline in the achievement gap between students whose parents have less than a college education and those whose parents had some college or completed college (Table 7). Thus, because these measures of SES differences cover fairly broad SES categories, we cannot pick up the increase in the achievement gap between students from very high-income families and everyone else found by Reardon in 2011. Rather, our evidence shows no significant change. It is worth noting that Reardon, Waldfogel, and Bassok 2016 also find no increase—in fact they find a modest decrease in the social class gap in this first decade of the 21st century, at least for children entering kindergarten. More research on this pattern and its causes is underway. When we include state fixed effects in the models (Table 7, bottom panel), the coefficients for FRPL eligibility and parents’ education get smaller, particularly in Models I and II. This suggests that poor students are somewhat more likely than others to live in poor states—not much of a surprise. Further, when we control for average FRPL eligibility and racial concentration in schools (Model III), the coefficients change little by including state fixed effects. This suggests that most of the state effects are captured by the average socioeconomic background of the schools’ student body. How eighth-graders perform on math tests relative to their peers, by socioeconomic status (SES), 2003, 2007, and 2013. Black-white, Hispanic-white, Asian-white, and SES achievement gaps in the fourth grade were similar to those in the eighth grade, with some exceptions. The fourth-grade NAEP student questionnaires do not provide data on parents’ education (the explanation being that nine-year-olds are not expected to be able to accurately answer that question). The absence of this education variable in the fourth-grade estimates has some influence on race/ethnicity and FRPL eligibility coefficients. Hence, they are not strictly comparable with the eighth-grade estimates. But an alternative specification in the eighth-grade estimates, without data on parents’ education, does change the level of the race/ethnicity and FRPL eligibility coefficients, but not the pattern of change over time. Two differences are notable between the fourth- and eighth-grade patterns. First, in eighth grade, the decline in the black-white math gap is greater than the decline in the reading gap, and in fourth grade, the opposite is true. Second, the math achievement gap among fourth-graders (in favor of boys) has declined more than the gap in eighth grade, and the fourth-grade reading gap in favor of girls is lower and has declined much more than it has in eighth grade (Table 8). Gaps between ELL students and whites are smaller in fourth grade than they are in eighth grade, which is consistent with the practice of reassigning many fourth-grade English language learners to regular classes by the end of primary school. It is also consistent with the fact that students still designated English language learners in eighth grade are those with the greatest language problems. The impact of the fixed effects on the Hispanic and Asian achievement gaps in fourth grade is similar to that in eighth grade for the same reason: There is a greater concentration of some groups in lower-scoring California and Hawaii, especially as reflected in data from 2003. Were these changes in race/ethnic and SES achievement gaps a continuation of earlier changes that occurred from 1996 to 2003? We extended our analysis back to 1996 only for eighth-grade mathematics. About 80 percent of states participated in the NAEP in the years before 2003, so the results are not completely comparable with the 2003–2013 results. However, they provide some indication of whether the trend in, say, the Model II estimate is very different from the trend apparent before 2003. We find that the reduction in the black-white math achievement gap was about the same before 2003 and after 2003, but that the decrease in the white-Hispanic non-ELL gap and, especially, the increase in the gap between whites and Asian non-ELLs was greater after 2003 (see Figure B). The fact that the gap between whites and Hispanic non-English language learners is shrinking while the gap between Asian students and whites is increasing may help us understand the kinds of pressure affecting whites at opposite ends of the SES spectrum. At the lower end, Hispanic non-ELLs are quickly catching up to whites in terms of achievement in both reading and math, undoubtedly increasing competition for places in second-tier colleges and in the job market. At the upper end of the SES spectrum, the mean achievement of Asian students is now much above that of whites—and is rising. This phenomenon could be increasing competition between Asian students and higher-SES white students to gain entrance to elite U.S. universities. Notes: Race/ethnicity coefficients in this graph are based on regression estimates that, in addition to race/ethnicity,control only for students’ gender, special education status, free or reduced-price lunch eligibility, and mother’s education. Figure C shows the test score gaps between poor students (eligible for free or reduced-price lunch) and nonpoor students (those ineligible for free or reduced-price lunch), referred to as the socioeconomic, or social-class, gap. As the figure shows, the SES gap for the poorest students (those eligible for free lunch) got smaller in the late 1990s but increased again in the mid-2000s, perhaps influenced by the recession. This was not the case for less-poor students (those eligible for reduced-price lunch), as their gap relative to students who were not eligible for FRPL remained relatively stable until 2011, though it increased in 2013. Figure C therefore suggests that among the poorest students (those eligible for free lunch), school achievement may be influenced by economic conditions. In other words, achievement may rise when the economy is doing well and decline when there is a recession. The proportion of those eligible for free lunch grew more in absolute terms from 1996 to 2007 than from 2007 to 2013 (see Table 1). Thus, it is unlikely that the increasing socioeconomic test score gap in the later period results from a more substantial increase in the number of poor students. Notes: Coefficients of reduced-price lunch and free lunch in this graph are from regression estimates that, in addition to students’ free or reduced-price lunch (FRPL) status, include only students’ race/ethnicity, gender, and special education status. When we divide the NAEP sample into male and female students, the achievement gap in eighth-grade math and reading between black and Hispanic female students and white female students is smaller than the male gap in math—and for black females (but not Hispanics), also smaller in reading (Tables 9a and 9b). Asian non-ELL females used to have a greater advantage over white females than Asian males in math, but this inverted by 2013. Asian females continue to have a greater advantage in reading than Asian males compared to whites of the same gender. 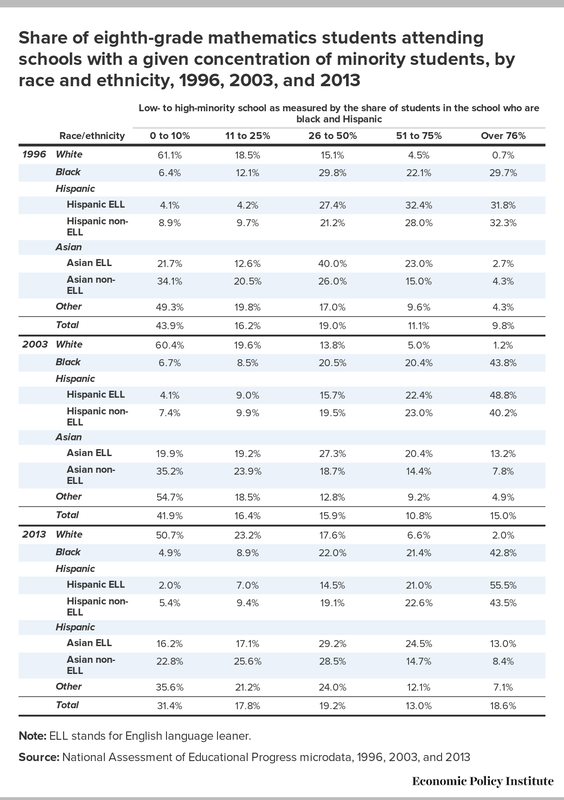 Otherwise, the trends are the same as indicated in Tables 6a and 6b: the black and Hispanic non-ELL gaps with whites got smaller for both sexes, and the gap between Asians and whites increased between both sexes. The FRPL gaps have also had different trajectories for male and female students. In mathematics, the reduced-price lunch (for somewhat poor students) gap was lower for female students in 2003 but was much higher by 2013. The opposite was true for the free lunch (for very poor students) gap—it was higher for females in 2003 but was lower by 2013. The male-female trajectories moved in opposite directions. However, the eighth-grade reading gaps for male and female students eligible for both reduced-price and free lunch moved in the same direction—they increased. Nevertheless, they did so more for females than males between 2007 and 2013. Did the recession have a greater impact on girls than boys? These results suggest that possibility (Tables 9a and 9b). Tables 10a and 10b show that the mathematics achievement gap is greater for lower- and middle-scoring black and Hispanic students than for those in the top tercile. The patterns of change in the gaps from 2003 to 2013 are similar for each race/ethnicity group, as shown by the overall pattern in Tables 6a and 6b. However, it appears that for Hispanic non-English language learners, the gap closed more for those in the lowest tercile. For Asian non-ELL students, the gap with whites increased most in the lowest tercile group, though the increase was large in all three groups. In the upper tercile, the mathematics gap between Asian non-ELLs and whites increased in favor of Asian-Americans from 0.31 standard deviations in 2003 to 0.54 SDs in 2013, and the gap in reading increased from 0.11 SD to almost 0.27 SD. The performance of the highest tercile of Hispanic non-ELLs increased more modestly compared with the highest tercile of whites: the gaps decreased from 0.18 SD to 0.14 SD in math, and declined from 0.13 SD. to 0.11 SD in reading. 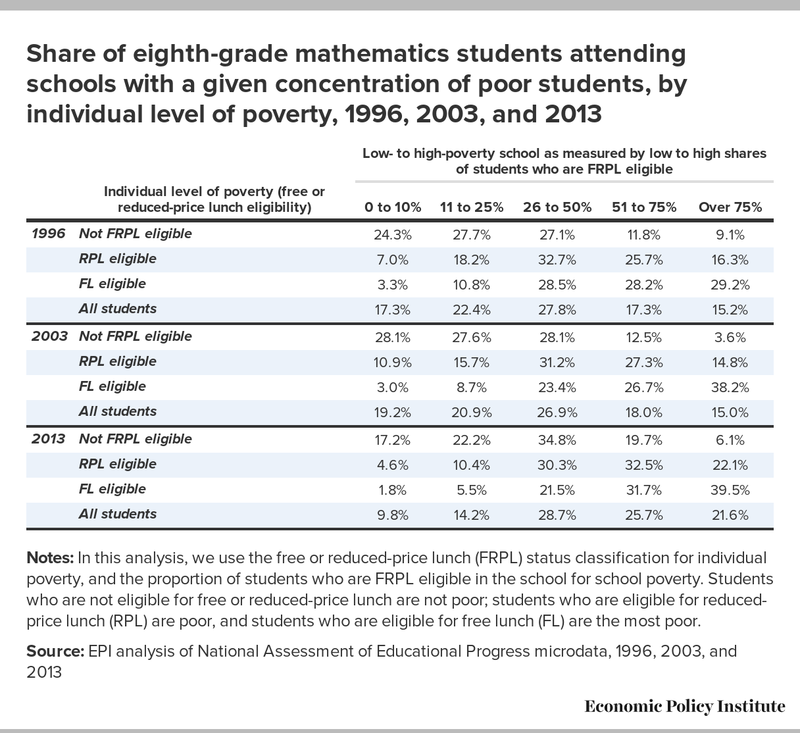 The poverty gap in mathematics for both poor students (those eligible for free lunch) and less-poor students (those eligible for reduced-price lunch) increased across tercile groups from 2003 to 2013 (Table 10a). This was true for all except the less poor in the highest-tercile, where the gap became insignificantly different from zero in 2013. In eighth-grade reading, the gap for both poor and less-poor students increased for all three terciles, but much more so for the highest-scoring students than for low- and middle-scoring students (Table 10b). Does the race/ethnic and class composition of schools matter for black and Hispanic achievement gaps? We showed above that schools in the NAEP sample were characterized by increasing concentrations of students eligible for FRPL and of minority (black and Hispanic) students.22 What impact might this increasing concentration have had on the math and reading achievement of black and Hispanic students? We find that, for blacks and Hispanics, attending a high-poverty school did not increase the math achievement gap compared with whites, apparently because attending a high-poverty school has a larger negative impact on white students than on black or Hispanic students. To the contrary, attending a school with a high concentration of black plus Hispanic students had a negative effect on black and Hispanic students’ math achievement gap compared to whites. Table 11 presents the results regarding the relationship between eighth-grade math achievement and the interaction of individual poverty and individual race/ethnicity with the percentage of poor and black plus Hispanic students in the school. When we estimate the effect of a school’s poverty level and minority concentration on individual math achievement, we find a fairly robust and increasingly negative relationship between the school’s poverty level and achievement. We also find an ultimately positive effect of attending a school with a higher percentage of blacks and Hispanics in recent years (2007 and 2013). That is, controlling for individual student characteristics and the poverty level of the school, attending a school with a higher percentage of blacks and Hispanics actually had a small positive influence on math test scores. More surprising, for students eligible for free or reduced-price lunch, attending a higher- poverty school seemed to be positively related to achievement compared with students not eligible for FRPL attending a higher-poverty school (Model II). Such a seemingly anomalous relationship could be the result of a larger negative impact on students not eligible for FRPL who attended a high-poverty school. Further, among poorer students compared with non-poor students, the positive relationship between achievement and attending a high-poverty school increased in the period 2003–2013. Therefore, the overall effect of being in a higher-poverty school became increasingly negative during this period as the level of poverty in schools increased. Yet, for poorer students, the effect of being in a poorer school became increasingly less negative than it did for students who were more well-off. At the same time, attending a higher-poverty school had a negligible impact on the black-white math score gap, but by 2013 it had become a small negative effect. Increasing poverty levels in schools were associated with smaller math gaps between whites and Hispanics (ELLs and non-ELLs) but was associated with larger math gaps for blacks (Table 11, Model II). Attending schools with higher concentrations of black and Hispanic students had and continues to have a negative effect on the achievement of blacks and Hispanics compared with its impact on white student achievement (Table 11, Model III). For blacks, the estimated negative coefficient for this interaction effect stays essentially the same from 2003 to 2013. For Hispanic ELL students, the coefficient starts out much larger in 2003, meaning that the impact of being in a high-concentration black/Hispanic school is greater than for whites, blacks, and Hispanic non-ELLs. But, surprisingly, this negative effect on Hispanic ELLs declined over time, whereas for Hispanic non-ELLs, it became increasingly negative. Thus, as the racial makeup of schools becomes increasingly Hispanic (and therefore minority), the negative effect of being in a high-minority school seems to decline for Hispanic ELL students and increase for non-ELL Hispanic students. This is not the case for Asian students: the effect of being in a high-minority school was negative for both ELL and non-ELL students (larger for Asian ELLs), but there was little change in this effect in the period 2003–2013. When it comes to reading achievement, the effect of attending a higher-poverty school was similarly negative and remained constant from 2003 to 2013. But, unlike for math performance, the effect of attending a more highly concentrated minority school was not significant. In addition, as in the case of mathematics, attending a higher-poverty school was associated with higher reading scores for students eligible for free or reduced-price lunch compared with non-poor students. With regard to reading achievement, for all groups of students, the impact of attending a school with a higher concentration of poor students was very similar to the results for mathematics achievement as shown in Table 11. Further, again in terms of reading achievement, the effect over time of attending a school with a higher concentration of blacks and Hispanics students was similar to the one observed in mathematics achievement for blacks and Hispanics, but completely different for Asian students. For Asian English language learners and non-ELLs, the effect was essentially not statistically significant in the same period. In the context of steadily rising mathematics and reading test scores from 1996 to 2013, minority groups in the United States made achievement gains in both areas compared to white students. Those not classified as English language learners made even larger gains when we account for socioeconomic background differences. This finding applies to black, Hispanic, and Asian students in both fourth and eighth grade. In this same period, however, students of similar race/ethnicity from poorer families (those who qualified for free lunch) did not make consistent achievement gains relative to students from non-poor families (those ineligible for free or reduced-price lunch). Although the achievement gaps between blacks and whites declined in this period, they remained large in both reading and math. Further, the already-large gaps between English language learners and their non-ELL ethnic counterparts (and whites) became larger. In contrast, the achievement gap between whites and Hispanic non-ELLs dropped significantly when controlling for students’ socioeconomic status or social class. At the same time, the gap in math and reading scores favoring Asian non-ELL students compared with white students increased during this period, both overall and when controlling for students’ social class. It is important to note that the small achievement gap between whites and Hispanic non-ELLs reported for 2013, in both eighth and fourth grades (about 0.15 standard deviations in math and 0.10 SD in reading), is adjusted for socioeconomic background differences. We have to keep in mind that Hispanic non-ELL students (and Hispanics in general) are much more likely to be poor than whites—thus, the white-Hispanic non-English language learner gap adjusted for SES differences is relatively small, but the average achievement levels of Hispanic non-ELLs remained considerably below those of white students (see Figure A). Correspondingly, the considerable Asian-white gap we estimate in 2013 in favor of Asian-Americans is even somewhat larger if not adjusted for SES differences, since Asians have a higher average SES than whites (Figure A). The largest achievement gap of all, however—and one that does not decline in this period when adjusted for student social class—is the language-learner gap. It makes sense that ELL students should not do as well on tests as students who are more proficient in English. However, after several years in the ELL track, when students are incorporated into regular tracks, they are much less likely to enroll in honors classes or eighth-grade algebra—a gateway course for the college track in high school (Umansky 2014). An important question is whether the size of the language learner gap in part reflects unequal academic treatment of ELL students in schools, including poor language training, lower academic expectations, and reduced access to a high-level academic curriculum. The fourth and eighth-grade achievement gaps in mathematics and reading between white students and Hispanic ELL students was much larger than any of the other race/ethnic or social-class gaps. The gap between whites and Asian English language learners in reading was also much larger than the other gaps. Even in mathematics, the achievement gap between whites and Asian ELLs was almost as large as that between blacks and whites. Furthermore, neither of the ethnic language gaps declined from 2003 to 2013 in either math or reading—and, in most estimates, increased. Our results also suggest that the increase in schools with large proportions of blacks and Hispanics from 2003 to 2013 probably had a bigger negative impact on the minority-white eighth-grade math achievement gap than the effect of the increase in the average proportion of students eligible for free or reduced-price lunch. It is important to note that the proportion of students eligible for FRPL and the proportion of disadvantaged minorities in a school are highly correlated. Yet, even though poverty and race/ethnicity are intertwined in U.S. schools, it is worth considering why the proportion of blacks and Hispanics in a school may have a larger negative relationship to the black-white, Hispanic-white, and Asian-white achievement gap than does the proportion of poor students in a school. Does the presence of a high percentage of students of color, whether poor or not, make schools different from those where a high proportion of students are poor but white? Is this the result of different academic expectations in disadvantaged minority schools? Is it the result of a greater emphasis on discipline? Or is it related to inequities in education resources? What insights may these changing race/ethnicity achievement gaps give us about other phenomena? We have highlighted the rapid decrease in the white-Hispanic non-ELL achievement gap after 2003, and particularly after 2007, as well as the rapid increase in the Asian-white achievement advantage over whites, especially in mathematics. The black-white achievement gap has also declined but, in contrast to the white-Hispanic non-ELL gap, still remains very large. The same is true for both the achievement gap between whites and ELL students who are Hispanic and Asian—those gaps are not only higher than the black-white gap in reading and almost as high (among Asian ELLs) or higher (among Hispanic ELLs) in mathematics, but they do not appear to be declining. These patterns of change (or lack of change) could have important implications for what is happening in American society in general and in U.S. schools in particular. First, in addition to the black-white achievement gap (which remains a difficult-to-alter feature of U.S. education), there appears to be an increasing division in our schools related to English language learner status. Even though the English language learner designation is an alterable characteristic, it carries academic consequences, particularly for lower-social-class students, which continue beyond leaving the ELL track (i.e., becoming sufficiently proficient in the English language). Some have argued that this has always been a feature of our immigrant society—it may take several generations for non-English speakers (immigrants), particularly those coming from traditional rural societies, to be fully absorbed into American society. The assimilation process appears to be happening for Hispanics; once they achieve non-ELL status, the gap between their test scores and that of their white peers has closed considerably. But schools have still not found a way to reduce the gaps between Hispanic and Asian English language learners and their non-ELL ethnic counterparts and between these ethnic ELL students and white students. Also apparently, broader economic and social policies have failed to mitigate the severe disadvantages these groups, especially Hispanic ELL children, experience in terms of poverty, immigration, and so forth. Indeed, the gap between Hispanic ELL and white children got larger in both reading and math from 2003 to 2013. Second, as alluded to above, assimilation of Hispanics appears to be working. Non-ELL Hispanics are closing the achievement gap with whites—even as white achievement is increasing and even as non-ELL Hispanics attend schools that are much more likely to have high concentrations of poor and minority students. (These higher concentrations generally have negative influences on individual test scores.) It could be argued that this trend is a “natural” result of assimilation, similar to that which occurred for children of Irish, Italians, Polish, and other immigrant families that had lower socioeconomic status when they first settled in America. In this sense, the fact that Hispanics who have been in the country long enough to become proficient English speakers are catching up is something that should be celebrated and considered part of our assimilationist tradition. Instead, it is possible that the anti-immigrant language of Donald Trump’s presidential campaign took hold in part due to the misplaced fear that Hispanic gains in education mean that less educated white workers face increasing competition from Hispanics for their jobs. This could explain support of policies that profess to protect current and future jobs from such competition. Yet, at least in the short and medium run, policies that seek to expel recent immigrants and keep out new ones will not solve the problem and could make it worse. For one thing, non-ELL Hispanics—the ones who are catching up—are likely to be second and third generation residents of the United States, not recent or new immigrants. Thus exploiting resentment against Hispanics and nonwhites more generally with anti-immigrant policies is unlikely to remove labor force competition for whites. For another thing, if past U.S. history of “divide and conquer” politics is any indication, expelling new immigrants is likely to keep white wages lower (Reich 1978). The political focus on immigration reform affects undocumented immigrants, who are disproportionately in low-paying manual jobs, and experience low economic and social integration. This group is unlikely to be currently competing for the vast majority of “better jobs” available to U.S. citizens. As far as the effect that undocumented immigrants may have on overall wage levels, a less economically disruptive policy than expulsion to combat downward wage pull would be to increase the minimum wage and to make today’s undocumented workforce legal. Making today’s undocumented workforce legal (and therefore less subject to wage exploitation) would likely raise its wages, and in so doing raise the wages of other workers employed in the same industries and occupations. Rather than keeping out immigrants who are not competing academically with white students when they first arrive, a better approach would be to aim to build on the gains already apparent in white student achievement. One such policy response would be to aim toward greater cohesion in ethnically diverse schools attended by significant proportions of whites. This policy response comes from our results that show that attending schools with higher concentrations of minority students has a more negative effect on white scores than on Hispanic ELL scores. Another policy response would be to improve absolute average achievement of lower (and higher) SES whites and minority groups with state policies that reduce poverty and with public education policies that raise and implement higher curricular standards (Carnoy, García, and Khavenson 2015). A third point that emerges from our study is that the major increase in achievement among Asian students relative to that of whites (and to that of everyone else), especially in mathematics, has probably increased the pressure on upper-middle-class white families to invest even more in their children’s tutoring and outside-of-school academic activities so that they can compete for places in elite universities. The share of Asian-origin students in the top-25 U.S. universities, as defined by U.S. News and World Report, reached 21 percent in 2007 and has stayed at that level. In contrast, the percentage of whites in those universities fell from 48 percent to 43 percent from 2007 to 2014 (NCES, IPEDS 2016). As Reardon (2011) argues, increasing income inequality over the past three decades is probably one explanation for the widening achievement gap between pupils in families with the highest 10 percent of income and everyone else. But another explanation could be the fact that Asians, who score higher on tests, make up an increasing proportion of high-income American families, forcing non-Asian high-income Americans to respond to the reality of academic competition from this “new” group for university places. Most Americans consider as desirable the goals of (a) providing high-quality education for all, (b) leveling the playing field, and (c) closing the achievement gaps between the poor and the non-poor and between race/ethnic minorities and whites. However, once these gaps close or a minority group begins to outperform the majority population, it is less clear how supportive the traditional majority is of actually achieving these goals. This is especially true when the majority perceives the results of equalization policies as existential threats to them or their children’s upward mobility. The 2016 election results suggest that this perceived threat still has political legs. The election is likely to translate into policies that do not necessarily help lower- and lower-middle-class whites, but could slow the gains being made by Hispanics and blacks (and women). However, there is no need to see policies aimed at raising achievement levels as a zero-sum game. Universal public early childhood education would disproportionately benefit single parents with children, who are still majority white, as well as low-income families more generally, who are disproportionately of color. Investment in higher quality public education (including Common Core) would benefit white children as much or more than black and Hispanic children. In an earlier study, we identified U.S. states by the gains students made in 1992–2013 on the National Assessment of Educational Progress eighth-grade mathematics test (Carnoy, García, and Khavenson 2015). Six of the ten states with the smallest gains in these two decades had minimal minority populations, two more (Michigan and Wisconsin) were Rust Belt states with long histories of promoting vouchers and charter schools to stimulate privately managed education, to no avail (Miron, Coryn, and Mackety 2007). The vast majority of students in all these states are white. Their educational problem is not that second and third generation Hispanics are closing the achievement gap or that Asian students are making larger gains than whites. The white students in these states are making lower gains because their state governments are not making the kinds of public school reforms made by other states, such as Massachusetts, Minnesota, Texas, Vermont, and, in the 1990s, North Carolina. The reforms varied from state to state, but all included strengthening their math curriculum and providing training to teachers to implement it. Thus, early childhood education, strengthening public education, and investing in after school and summer enrichment programs no doubt do help low-income minority students, but they also have helped and continue to help increase lower- and middle-class white students’ academic achievement, high school completion, and college going. That is not going to solve the malaise of less-educated white America, but neither is doing nothing or implementing policies that don’t work for anyone. Martin Carnoy is Vida Jacks Professor of Education and Economics at Stanford University and a research associate of the Economic Policy Institute. He has written more than 30 books and 150 articles on political economy, educational issues, and labor economics. He holds an electrical engineering degree from Caltech and a Ph.D. in economics from the University of Chicago. Much of his work is comparative and international. His recent books include Sustaining the New Economy: Work, Family and Community in the Information Age, The Charter School Dust-Up (coauthored with Richard Rothstein), Vouchers and Public School Performance, Cuba’s Academic Advantage, and The Low Achievement Trap. Emma García is education economist at the Economic Policy Institute, where she specializes in the economics of education and education policy. Her areas of research include analysis of the production of education, returns to education, program evaluation, international comparative education, human development, and cost-effectiveness and cost-benefit analysis in education. Prior to joining EPI, García conducted research for the Center for Benefit-Cost Studies of Education and other research centers at Teachers College, Columbia University, and did consulting work for the National Institute for Early Education Research, MDRC, and the Inter-American Development Bank. García has a Ph.D. in Economics and Education from Teachers College, Columbia University. The authors gratefully acknowledge professor Richard Murnane for his helpful comments and advice on an earlier draft of the paper. They also appreciate Richard Rothstein’s, Lawrence Mishel’s and Elaine Weiss’s feedback on versions prior to the completion of this study. The authors are also grateful to Lora Engdahl and Leslie Bachman for editing this report, to Zane Mokhiber for his work formatting the tables and figures, and to Margaret Poydock for layout. Finally, they appreciate the assistance of the Economic Policy Institute communications staff who helped to disseminate it. 1. This count is generally available at the school level, while the poverty rate is typically not available. 2. Throughout the report, when we use the term high-poverty school or highest-poverty school, we refer to the schools with more than 75 percent of their students being eligible for free or reduced-price lunch (FRPL). This does not mean that schools with, say, 35 or 50 percent of students being FRPL eligible are low poverty. It just means that our report focuses on the highest poverty category. 3. The shares of Hispanic and Asian students who are designated as ELL have declined or stayed constant since 2003. In 2013, about one-third of Hispanic fourth-graders and one-fifth of Asian fourth-graders were designated ELL. The proportions designated ELL in eighth grade were much lower; about one-fifth of Hispanic students and about 16 percent of Asian students. In 2003, about 42 percent of Hispanic fourth-graders and one-fifth of Asian fourth-graders were designated ELL, compared with 28 percent of Hispanic eighth-graders and 15 percent of Asian eighth-graders. 4. Our results also control for special education status in both fourth and eighth grade, and, in eighth grade, for parental education. 5. These percentages are calculated using the sample of students in math in fourth and eighth grade in 2013. In 2014, 9.3 percent of all public school students participated in programs for English language learners, of whom about 78 percent were Hispanics and 11 percent were Asian (National Center for Education Statistics Digest of Education Statistics 2015). 6. We use the free lunch or reduced-price lunch (FRPL) status classification as a metric for individual poverty, and the proportion of students who are eligible for FRPL as a metric for school poverty. The limitations of these variables to measure economic status are discussed in depth in Michelmore and Dynarski’s (2016) recent study. FRPL statuses are nevertheless valid and widely used proxies of low(er) SES, and students’ test scores are likely to reflect such disadvantage. 8. We did not include an analysis of the 1992 data because information on whether students were eligible for free or reduced-price lunch was not included in that year’s survey. 9. This paper’s main objective is to address existing gaps by race, ethnicity, and SES, irrespective of the state where students live. Hence, our focus is not on whether gaps are larger or smaller in some states as a result of differences across states in the concentration of minorities, in policies, or in any other fixed policy or state characteristic, and consequently, most of our estimates do not include the state fixed effects. However, we offer a comparison of the results obtained with and without fixed effects (see panels “With state fixed effects” and “Without state fixed effects” in the results tables). 10. For most years, there were five plausible values for each student’s score in reading and math. The analytic results account for this feature of the survey and others (replication weights and so forth). 12. See National Center for Education Statistics Digest of Education Statistics 2015, Table 204.10. 13. In the overall K-12 student public school population, in fall 2014, white students enrolled in public elementary and secondary schools constituted just below 50 percent (49.9 percent). 15. Since 2010, as mentioned, this was partly affected by the change in FRPL-eligibility to Community Eligibility. 16. The values differ minimally from those reported as totals in Table 1, due to missing values in the cross-tabulation of individual and school poverty variables. 17. Typically, 1 standard deviation equals 30 to 35 score points in the NAEP scale. The exact values change depending on the year and the test. For these calculations, we used the national test SD values for eighth-grade math in 2003 (36.2 score points). The standard deviation figures in the text might not match the figures in data tables behind the figures due to rounding. 18. We estimate the relative size of the race/ethnic gaps, controlling for student gender, socio-economic differences, and whether a student is in special education. We estimate the socio-economic gaps, controlling for student gender, race/ethnicity, and whether the student is in special education. Table 5 regressions do not include state fixed effects. In tables not yet presented, we show results with and without state fixed effects. 19. The percentage explained by social class, gender, and special education is about 5 percent higher in 2013, indicating the larger weight of these covariates in explaining race/ethnic gaps in the most recent year. 20. As before, when compared with the unadjusted math gaps in Figure A, these adjusted math gaps suggest that about 20–25 percent of the unadjusted white-Asian ELL and white-Hispanic ELL math gaps in 2003 are explained by students’ social class, gender, and special education designation, not by race/ethnicity. 21. Only one set of eighth-grade coefficients (again, as for Hispanics, mainly in Model III) support the hypothesis that the white-Asian ELL mathematics gap—but not the reading gap—in (the small sample of) Asian ELL students is systematically decreasing, and that the gap between whites and Asian non-ELLs is increasing because of more stringent reassignment rules. However, since this pattern does not appear in other model estimates of mathematics achievement, nor in the reading achievement estimates, it is more likely that the declining gap in Model III results from a statistical correlation between school composition and Asian ELL students’ mathematics achievement. As shown below, the fourth-grade ELL patterns are similar to those in eighth grade. 22. However, a small part of this increase probably resulted from the implementation of the Community Eligibility FRPL classification of entire schools after 2010. Alexander, K. L., D. Entwisle, and L. Olson. 2007. “Lasting Consequences of the Summer Learning Gap.” American Sociological Review 72: 167–80. Autor, D. H., D. Figlio, K. Karbownik, J. Roth, and M. Wasserman. 2016. School Quality and the Gender Gap in Educational Achievement. National Bureau of Economic Research Working Paper No. 21908. Balart, P., M. Oosterveen, and H. D. Webbink. 2015. Test Scores, Noncognitive Skills, and Economic Growth. Bonn, Germany: IZA, DP No. 9559. Belfield, C., and H. M. Levin, eds. 2007. The Price We Pay: Economic and Social Consequences of Inadequate Education. Washington, DC: The Brookings Institution. Bowles, S., and H. Gintis. 1975. Schooling in Capitalist America: Educational Reform and the Contradictions of Economic Life. New York: Basic Books. Bowles, S., H. Gintis, and M. Osborne. 2001. “The Determinants of Earnings: A Behavioral Approach.” Journal of Economic Literature 39: 1137–76. Card, D., and J. Rothstein. 2007. “Racial Segregation and the Black-White Test Score Gap.” Journal of Public Economics 91(11–12): 2158–84. Carnoy, M., E. García, and T. Khavenson. 2015. Bringing It Back Home: Why State Comparisons Are More Useful than International Comparisons for Improving US Education Policy. Washington, DC: Economic Policy Institute. Castex, G., and E. K. Dechter. 2014. “The Changing Roles of Education and Ability in Wage Determination.” Journal of Labor Economics 32(4): 685–710. Coleman, J. S., E. Campbell, and C. Hobson. 1966. Equality of Educational Opportunity. Washington, DC: U.S. Department of Health, Education, and Welfare. Fryer, R. G., and S. D. Levitt. 2004. “Understanding the Black-White Test Score Gap in the First Two Years of School.” Review of Economics and Statistics 86(2): 447–64. Fryer, R. G., and S. D. Levitt. 2006. “The Black-White Test Score Gap through Third Grade.” American Law and Economics Review 8(2): 249–81. García, E. 2015. Inequalities at the Starting Gate: Cognitive and Noncognitive Skills Gaps between 2010–2011 Kindergarten Classmates. Washington, DC: Economic Policy Institute. García, E, and E. Weiss. 2014. Segregation and Peers’ Characteristics in the 2010–2011 Kindergarten Class: 60 Years after Brown v. Board of Education. Washington, DC: Economic Policy Institute. Gregory, A., R. Skiba, and P. Noguera. 2010. “The Achievement Gap and the Discipline Gap: Two Sides of the Same Coin?” Educational Researcher 39(1): 59–68. Hanushek, R., J. Kain, and S. Rivkin. 2002. New Evidence about Brown v. Board of Education: The Complex Effects of School Racial Composition on Achievement. National Bureau of Economic Research Working Paper No. 8741. Hedges, L., and A. Nowell. 1999. “Changes in the Black-White Gap in Achievement Test Scores.” Sociology of Education 72(2): 111–35. Jencks, C., and M. Phillips, eds. 1998. The Black-White Test Score Gap: Why It Persists and What Can Be Done. Washington, DC: Brookings Institution Press. Joo, N., R. Reeves, and E. Rodrigue. 2016. Asian American Success and the Pitfalls of Generalization. Social Mobility Memos. Washington, DC: The Brookings Institution. Lee, S. 2009. Unraveling the “Model Minority” Stereotype: Listening to Asian American Youth, 2nd ed. New York: Teachers College Press. Lee, Valerie E., and David T. Burkam. 2002. Inequalilty at the Starting Gare. Washington, DC: Economic Policy Institute. Magnuson, K., D. Rosenbaum, and J. Waldfogel. 2008. “Inequality and Black-White Achievement Trends in the NAEP.” In Steady Gains and Stalled Progress: Inequality and the Black-White Test Score Gap, K. Magnuson and J. Waldfogel, eds. New York: Russell Sage Foundation. Michelmore, K., and S. Dynarski. 2016. The Gap within the Gap: Using Longitudinal Data to Understand Income Differences in Student Achievement. National Bureau of Economic Research Working Paper No. 22474. Miron, G., C. Coryn, and D. Mackety. 2007. Evaluating the Impact of Charter Schools on Student Achievement: A Longitudinal Look at the Great Lakes States. East Lansing, MI: The Great Lakes Center for Education Research & Practice. Murnane, R., J. Willett, and F. Levy. 1995. “The Growing Importance of Cognitive Skills in Wage Determination.” Review of Economics and Statistics 77(2): 251–66. Musu-Gillette, L., J. Robinson, J. McFarland, A. KewalRamani, A. Zhang, and S. Wilkinson-Flicker. 2016. Status and Trends in the Education of Racial and Ethnic Groups 2016 (NCES 2016-007). Washington, DC: U.S. Department of Education, National Center for Education Statistics. http://nces.ed.gov/pubsearch. National Center for Education Statistics (NCES), National Assessment of Educational Progress (NAEP), 1996, 2000, 2003, 2005, 2007, 2009, 2011, 2013 and 2015 Mathematics Assessments. Main NAEP Data Explorer. National Center for Education Statistics (NCES), National Assessment of Educational Progress (NAEP). Various years. NAEP microdata (unpublished data). Nores, M., and W. S. Barnett. 2014. Access to High Quality Early Care and Education: Readiness and Opportunity Gaps in America. New Brunswick, NJ: Center on Enhancing Early Learning Outcomes. Nores, M., and E. García. 2014. “Language, Immigration and Hispanics. Understanding Achievement Gaps in the Early Years.” Paper presented at the Association for Public Policy Analysis and Management Fall Research Conference, Albuquerque, NM, November 6–8. Orfield, G., and E. Frankenberg, with J. Ee and J. Kuscera. 2014. Brown at 60: Great Progress, a Long Retreat and an Uncertain Future. The Civil Rights Project. Berkeley: University of California Press. Putnam, R. 2015. Our Kids: The American Dream in Crisis. New York: Simon and Schuster. Reardon, S. 2011. “The Widening Achievement Gap between the Rich and Poor: New Evidence and Possible Explanations.” In Whither Opportunity? : Rising Inequality, Schools, and Children’s Life Chances, G. Duncan and R. Murnane, eds. New York: Russell Sage. Reardon, S. F., and C. Galindo. 2009. “The Hispanic-White Achievement Gap in Math and Reading in the Elementary Grades,” American Educational Research Journal 46(3): 853–91. Reardon, S., J. Robinson-Cimpian, and E. Weathers. 2015. “Patterns and Trends in Racial/Ethnic and Socio-economic Achievement Gaps.” In Handbook of Research in Education Finance and Policy, H. Ladd and M. Goertz, eds. New York: Routledge. Reardon, S., J. Waldfogel, and D. Bassok. 2016. “The Good News about Education Inequality.” New York Times, August 26. Reardon, S., and J. T. Yun. 2001. “Suburban Racial Change and Suburban School Segregation, 1987–95.” Sociology of Education 74(2): 79–101. Reich, M. 1978. “Who Benefits from Racism? The Distribution among Whites of Gains and Losses from Racial Inequality.” Journal of Human Resources, 13(4): 534-44. Robinson, J., and S. Lubienski. 2011. “The Development of Gender Achievement Gaps in Mathematics and Reading in Elementary and Middle School: Examining Direct Cognitive Assessments and Teacher Ratings.” American Educational Research Journal 48(2): 268–302. Rothstein, R. 2005. Class and Schools: Using Social, Economic, and Educational Reform to Close the Achievement Gap. Washington, DC, and New York: Economic Policy Institute and Columbia University Teachers College. Rothestein, Richard. 2013. For Public Schools, Segregation Then, Segregation Since: Education and the Unfinished March. Washington, DC: Economic Policy Institute. Umansky, I. 2014. “Peeling Back the Label: Studies of Educational Opportunity among Students Learning English.” Unpublished PhD diss., Stanford University.